Now that the entire Battle for Zendikar set is revealed, I’m going to spend some time analyzing a deck that has much to benefit from BFZ’s spoils: the Allies archetype. Recently discussed by Sheridan, Allies is a deck that has already had some success in the PPTQ scene. A Naya Allies build also had recent success at GP Oklahoma City, even before BFZ hit tournament tables. After reviewing Daniel Mulato’s list, I upgraded some of the weaker individual inclusions with recently revealed cards, improving on an already strong core strategy. As Sheridan mentioned, the strength of Allies has always been its ability to win out of nowhere with Collected Company and Akoum Battlesinger. BFZ promises to make the manabase more consistent but also to help Allies push through opponents instead of overwhelming (and confusing) them to death. I predict Allies will gain popularity due to its use of Aether Vial and Collected Company alone. Powering out efficient threats that effectively double as spells when another Ally enters the battlefield seems very good. Like the unforgiving Slivers deck Adam Bowman used to Top 8 the SCG Modern open in Cincinnati, Allies uses underpowered creatures and focuses on synergies that can quickly close out the game. Strategically similar to Merfolk, Allies is a more synergy focused Collected Company deck that does not rely on combos (Kitchen Finks, Viscera Seer, Melira, Sylvok Outcast) to win. Instead, we’re looking to drop a few early Allies and then force them through without warning, aiming to win from one or fewer attack steps. We’ll also leave the option open to play a longer, grindy attrition game. One of the major benefits of a synergistic deck like this is flexibility. Depending on the metagame, both the Allies you play and their numbers can move up or down to consistently beat any matchup. Effectively piloting any deck requires an understanding of each cards role, particularly in tuning to gain an edge in certain matchups and to avoid losing points to incorrect trimming. That’s truer than ever in Allies. Be warned: never, ever, mess with the deck’s backbones. The entire deck revolves around having Aether Vial and/or Collected Company to reach a critical mass of Ally creatures. Without them, the deck is just a synergistic creature pile that has difficulty pulling ahead in a tempo-based Modern metagame. Many creatures in the deck cost three and without some way to cheat these creatures into play the list is too clunky to work. Nearly every opening hand without either Vial or Company is a mulligan; very few decks lose to a few anemic early turn creatures that are useless without specifically sequenced buffs. With Aether Vial or Collected Company in hand, you pull ahead in the mid-game with two or more Ally creatures per turn. Aether Vial, the more important card of the two, keeps your spells safe from countermagic and helps play around sweepers. Vial also lets you hold up interactive cards like Path to Exile or Boros Charm. Just watch out for those Kolaghan’s Commands. Though not quite as impressive, Collected Company gains value as a way to apply massive pressure out of nowhere while selecting the most advantageous rally effects. Rally can make playing Collected Company difficult since hitting two rally creatures at end step loses some value, but as long as you have a follow-up Ally creature on your own turn it is not very disadvantageous. When casting main phase Collected Company, be sure to keep rally effects in mind, especially if you need lifelink or other effects to survive or close out the game that turn. Though Aether Vial and Collected Company are certainly critical pieces in the deck, let’s examine the creatures that really make this strategy tick. Focusing on new additions from Battle for Zendikar, the deck gains four very powerful cards in , , , and . is the card that excites me most when it comes to beating decks like Abzan (or any creature matchup) that stabilizes through creature combat. Giving all your creatures menace whenever Mage or another Ally enters under your control allows congested board states to turn from even to advantageous. Since all rally creatures trigger upon entering, playing after deploying other Ally creatures will surprise your opponent and force damage past Lingering Souls and Tarmogoyf. One of the best features of rally compared to other tribal abilities is they do not require the creature to live for any amount of time upon entering the battlefield. This makes Allies more difficult for removal heavy decks like Jund and Abzan to deal with: you keep rally’s benefit through the combat step. This doesn’t happen when your Lord of Atlantis eats a Lightning Bolt mid-combat. That being said, is not powerful enough on an empty board to be anything other than a three-of late game card. utterly eviscerates any creature deck or any deck trying to block profitably or at parity. Much like , is especially effective as a combat trick with legs that gives all of your creatures first strike in repeatable fashion. This card pushes through damage and forces your opponent to create poor blocks, changing subpar board states into favorable ones. Vialing in Bladewhirl after blocks are declared can be especially brutal if the opponent was planning to use trades to stop you. These swingy types of effects break board stalls and win close matches. This can be particularly useful in a metagame with a lot of Naya Company and Affinity running around. Bladewhirl also comes down early and can attack for two on her own, which is itself not insignificant. Like Firemantle though, does not hold her own on an empty board and cannot attack alone through much even with first strike. The fact that she doesn’t grow like Kazandu Blademaster means you cannot rely on the Kor to create insurmountable pressure on her own. Unless the metagame shifts very heavily towards creatures and combo completely falls out of favor, I do not see myself running four. is a powerhouse addition that creates complex situations for any opponent. Often, players will talk about the threat of activation as a major asset among creatures with abilities. One of the benefits of a creature that can activate at instant speed for very little cost is that it is a constant threat, severely hampering the number of playlines opponents can take without fearing the ability. works wonderfully in the Allies list. Each Ally pumps her power, and can be tapped to give Veteran your choice of first strike, vigilance, or trample. Or tap multiple allies for multiple effects! This leaves the opponent unsure what or how to block each combat, a problem that Aether Vial and Collected Company makes even worse. Trample is especially beneficial in a deck like Allies, since pushing through the last few points of damage can be challenging. I really like this card in the deck, although she does not bolster any other creatures and cannot help the team get through an army of chump blockers. That’s why I did not overload on Warleaders. Think of Warleader as a finishing threat rather than a three drop and it makes sense as a two-of. Last, but certainly not least is . This card is phenomenal. An Ally with rally that grants all your creatures lifelink is backbreaking against aggressive matchups and can even throw off combo matches that often struggle doing more than 20 damage in one turn, such as Storm or Amulet Bloom. Unlike the old Talus Paladin, Scout has a more aggressive body and costs only three mana for Company. nearly made me cut all of the Ondu Clerics from my sideboard, but board stalled situations where I cannot risk attacking with many creatures made me keep the Clerics in the bench for now. The Scout, coupled with Cleric, really puts Allies in a favorable position against Burn and other hyper-aggressive strategies. Unfortunately, Scout isn’t very effective against Twin or decks capable of making multiple large threats quickly. If the format moves into a more aggressive, non-combo oriented metagame, I believe this card can bury any deck trying to race with conventional damage. Until that day, three copies of will give plenty of advantage in creature matchups without stifling pump draws to force through damage. I considered adding some number of Chord of Calling to the main deck as a way to tutor for specific rally effects. That said, adding more non-creature spells makes Collected Company a lot worse. Unlike the Slivers deck, Allies has very few silver bullet creatures either from Battle or original Zendikar. It’s also not optimal to play non-Ally creatures since they don’t trigger rally. Without the ability to hose your opponent’s plans with silver bullets like Eidolon of Rhetoric against Storm or Kataki, War’s Wage against Affinity, Chord becomes much worse. While I like the idea of tutoring for specific cards like Scout against aggressive decks, the convoking instant does not add enough to the overall strength of the deck. Deck space means that you can run either Chord or Vial, and Vial is more generally useful. Before discussing the sideboard, I would like to address that I really wanted to try one to two copies of in this deck. Unfortunately, the addition of on top of Cavern of Souls, makes casting a four mana double white non-Ally very difficult to achieve. Even so, in the future, I would like to try fitting Gideon into the sideboard. My sideboard is very similar to Daniel’s, with the exception of adding in a couple of Rending Volleys to help against Splinter Twin alongside the maindecked Path to Exiles. Combo is generally a bad matchup and we want to be prepared for the most popular ones. Since Affinity was performing well, I had been considering the second Ancient Grudge. After Lantern Control won Grand Prix Oklahoma City my decision was firm: Grudge is in a very good place right now. also makes an appearance. Spells with a single colored mana symbol work well with the updated manabase, and having an out to Tron is always a plus, especially since our game plan is particularly weak to Ugin, the Spirit Dragon, and Pyroclasm. To properly pilot this Allies deck, it is important to understand the deck’s weaknesses. 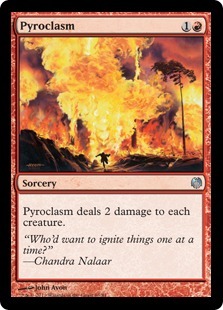 As mentioned above, Pyroclasm is a problem. Most of the creatures in this deck start small enough to die to Pyroclasm and Anger of the Gods, which makes playing against UR Splinter Twin or GR Tron much harder with both decks bringing down the wrath. Boros Charm is our out here – it gives all our creatures indestructible to survive sweepers. After our opponent’s Wrath has effectively fizzled, we can swing in for the kill next turn. Creatureless combo decks like Storm or Ad Nauseam can be very difficult to beat. Allies cannot afford to play much interaction due to Vial and Company so we have to race them before these decks can assemble their combos. Storm has some difficulties from Wear // Tear and our Scout or Ondu Cleric, since gaining huge amounts of life throws off their Grapeshot math. In decks like Ad Nauseam, where the matchup is naturally poor, applying pressure and aggressively mulliganing for hate cards is crucial. Without hate cards or an aggressive start, these kinds of matchups are extremely difficult to beat. Moving forward, matchups get better with more creature dependent decks, since our Allies combine to create unstoppable creatures that can easily overtake any board stall. In addition, the deck has the ability to close out a game quickly if the opponent stumbles on mana or cannot sequence their plays correctly. But be cautious; this deck also punishes pilots for incorrectly sequencing lands and spells. You have got to get very good at combat math and managing your rally triggers to play Allies well. Since the metagame is shifting in a creature-heavy direction this deck is very well positioned. It destroys Burn and crushes creature-based decks that lack combo aspects, and with decks like Naya Company enjoying such success at GP Oklahoma City, Allies is only going to get better. What do you think of the deck, and what cards do you think could help push Allies into the limelight at the next big event? Rally to the comment section and let me know! Hey broski! Awesome ideas here. I think a consideration for Atarka’s Command might be needed, or at the least discussion as to why you wouldn’t have it make the cut. The anthem effect seems great when going wide with a deck like this, the bolt gives a little more reach (similar to Boros Charm), and the stopping lifegain might be relevant at times. The worst mode on it is the extra land, but with a deck like this, it may come up on occasion to power out combo-type kills the following turn thanks to an additional mana. I would actually lean towards Dromoka’s Command here. It’s creature removal, Twin removal, sweeper protection, and gives a bit of sustained damage. Boros Charm also does the sweeper protection and the damage piece, but I like having more interactive options to prevent some matchups from becoming coin tosses. Command even helps against the random noninteractive decks, killing Electromancers, destroying Ascensions, and sacrificing Unlifes! I like the idea of Naya Allies if you’re not going to go the Hardened Scales route (if you do use that enchantment, I think the balance tilts toward Abzan instead), but I question several inclusions and exclusions here. Chief among the exclusions is Kazandu Blademaster, which is arguably the best Ally printed, yet missing from your deck. Secondly, how are you going to find the mana to cast Collected Company consistently without Harabaz Druid? 20 lands doesn’t typically lend itself to hitting 4 lands on curve. The last subject is more of a quibble – given that you’re running red, I’d really like to see Bolt in here somewhere, but I’m cognizant that Path deals with threats the deck can’t otherwise handle, and thus may be the better choice. On the subject of inclusions, why is Kor Bladewhirl here (presumably) over Kazandu Blademaster? Global first strike is cute, but nothing special – if it were, Highland Berserker would have seen play in Daniel Mulato’s version. Secondly, you have 15 (!) 3-drop creatures between Firemantle Mage, Adaptive Automaton, Veteran Warleader, Kabira Evangel, and Lantern Scout – that is unprecedented when compared to most successful Modern aggro decks (including its 2 closest comps, Merfolk and Elves), and is a major departure from what Mulato’s list went for (14 2-drops, 8 3+ drops) – you basically have to have a hand with an AEther Vial, or you risk getting stuck. Utility creatures are only helpful once your aggro base is established, and given that Akoum Bladesinger’s pump is only temporary (and does not give global haste), Hada Freeblade alone does not an aggro deck make. I’m sorry if this comes off as overly critical, but I think this deck has some big time questions to answer before it can be taken as a serious first draft. 3-drop-centric Vial aggro decks have been done time and time again, and they haven’t worked. Why will this one be any different? Furthermore, Allies have a multitude of beefy 2-drops available, and you can pick and choose from the support creatures you have outlined here to get them there. Why not do that instead? Sorry that I don’t have time to pick through your whole paragraph, at this point I’m fairly tired. The reason for all the 3 drops is quite simply, Collected Company. Collected Company is at its best when you get 2 3 drops, and the value is all generally downhill from there, putting 2 1 drops into play isn’t particularly exciting, so these kind of decks tend to lean away from traditional low drop creatures. That’s kind of a weak argument, honestly. The mana cost of the creatures doesn’t matter as much as what you get out of them. In the case of Allies, the beef is at the 2-drop spot, with Oran-Rief Survivalist, Akoum Bladesinger, and Kazandu Blademaster (you can even throw the Kor Bladewhirl in if you want). Your deck as currently constructed essentially prays for a T1 Freeblade and a T2 Akoum Bladesinger (or T1 Vial and T2 Bladesinger + Freeblade) to stick, then to hit 2 more land drops (hopefully while casting Allies every turn) so that you can flip a Company for value and maybe scrounge up enough damage + evasion for lethal. There are a lot of moving parts in that plan, and while some are just vicissitudes of the creature type (Allies are good when they’re casting dudes every single turn), others are entirely avoidable. I fail to see how this deck generates any notable sort of early pressure without both Freeblade and Bladesinger (due to the lack of size and high CMC of the creature base), and how it hits 4 mana consistently (due to the lack of ramp and low land count). I’m sorry, but this needs work. I agree strongly with this post. I too question the inclusion of Bladewhirl. There was access to a first strike ability before, in the form of the mentioned Highland Berserker, and it never really found a home in most ally decks. I still don’t know what to think of the Firemantle Mage. I consider its ability worse than that of the evangel and if you have both out, menace becomes irrelevant. But with all the 3 drop allies in this deck that do not grow with +1/+1 counters, amazing support cards like Abzan Falconer or Mirrors Entity are not that effective. So i see why this card was included over them. The blademaster is just penomenal. Being able to grow is something worth considering. Especially since i am failing to see what the support creatures are actually supporting. The only creatures that can grow and present a threat are Hada Freeblade and the Warleader. Even with the lord effect of Adaptive Automaton I see this deck getting stuck on a board with 3/3 creatures midgame where you have to hit a creature topdeck to make them being able to attack. And the colorfix should not be that hard, since there are only two lands that can not produce white mana for the blademaster. The inclusion of Lantern Scout in this build is understandable. Your vial being on three and the ability to be picked up by CoCo make this one a strong card in this deck, compared to the bigger Thalus Paladin. With a deck that has a lot of 3-drops, 20 lands seem to be dangerous. Maybe 22 lands or the inclusion of Harabaz Druid could provide a more consistent mana source to not be as reliant on the vial. I see that this deck tries to get the best out of vial and CoCo with playing 3-drops, but i do not see much pressure being build in turn one and two, compared to the 2-drop allies. I like to see allies that are more midrange. However i too would include more two drop allies to also have access to support cards like the falconer or mirror entity and to have more aggro on the board. Yeah, I realize that might have come off as a bit intense. But I really disagree strongly with the direction the author took this deck in, and I needed to make sure I got my 2 cents. As for your brews… I’ll be happy to take a look. I’ll be posting under the username rothgar13. Maybe if it was a one of from the utilities, using my list, then drop the scales, drop the vial, and add some of the utility cards. I think that could have potential. Or just go way down, and use scales maybe as a 2 of and same for vial. Is there an Ally that isn’t affordable? It’s the damn fetch lands, cavern of souls and the like that are out of reach by most but the rich and or dumb. And 600 dollars later you have a decent deck..